We’d love your help. Let us know what’s wrong with this preview of The Play of Death by Oliver Pötzsch. It is 1670 and Simon Fronwieser is in the town of Oberammergau to bring his seven-year-old son to boarding school. As he bids his boy a tearful farewell, news comes of a shocking murder: the man who was to play the part of Christ in the town’s Passion play has been found dead, nailed to the set’s cross. As there is no doctor in town, Simon is brought in to examine the body It is 1670 and Simon Fronwieser is in the town of Oberammergau to bring his seven-year-old son to boarding school. As he bids his boy a tearful farewell, news comes of a shocking murder: the man who was to play the part of Christ in the town’s Passion play has been found dead, nailed to the set’s cross. As there is no doctor in town, Simon is brought in to examine the body. The opportunities to spend more time with his son and to investigate the murder quickly convince him to stay. To ask other readers questions about The Play of Death, please sign up. Is this the final book in the series? Fariha No. The 7th book "The Council of Twelve" will be coming out in May 2018. Any idea when this will be translated into English? Although a little overly long, I enjoyed this well-written historical mystery. Jacob's drinking lands him in trouble and gives the council a reason to possibly oust him as hangman, Barbara is bringing shame on her dishonorable family, and Magdalena has a secret. I liked that the characters continue to develop and that we learn a lot about the social and political climate of the times. One of my favorite series. Es geht weiter mit den Geschichten um den Henker Jakob Kuisl! Auch im sechsten Ban Es geht weiter mit den Geschichten um den Henker Jakob Kuisl! Auch im sechsten Band geht es spannend weiter mit der Henkerstochter! Schon nach den ersten Seiten war ich sofort wieder drin. Die Familie der Kuisls ist mir schon sehr ans Herz gewachsen und Oliver Pötzsch schafft es jedes Mal wieder, mich mit den ersten Seiten zu packen! Die Atmosphäre dieser ursprünglichen Zeit ist perfekt getroffen und ich liebe den leicht bayerischen Dialekt, der dem ganzen seinen besonderen Reiz verleiht. Magdalena ist die Tochter des Schongauer Henkers Jakob Kuisl und hat in den vergangenen Jahren schon einiges mit ihrem griesgrämigen, temperamentvollen und scharfsinnigen Vater mitmachen müssen. Immer wieder gerät die Familie durch den unehrenhaften Beruf in verzwickte Morde, die dem alten Sturschädel Kuisl keine Ruhe lassen. Seine Neugier lässt ihn seine Nase überall reinstecken, ohne Rücksicht darauf, der Obrigkeit damit eventuell in die Quere zu kommen. Dieses Mal gibt es zwei Handlungsstränge, denn nicht nur der Bader Simon Fronwieser, der mit der Familie Kuisl verbunden ist, sieht sich einer Mordserie im fernen Oberammergau gegenüber; auch Barbara, die andere Tochter des Henkers, manövriert sich durch ihre Unbedachtheit in ein sehr gefährliches Ränkespiel, das die ganze Familie in Bedrängnis bringen könnte. Viele kleine Puzzlestückchen, die scheinbar wenig miteinander zu tun haben und sich am Ende zu einem runden Abschluss verbinden. Durch den Wechsel zwischen den beiden Ereignissen wird die Spannung immer weiter voran getrieben und steigert sich konstant, weswegen ich das Buch kaum aus der Hand legen konnte. Ich war auch trotz Anzahl der Seiten viel zu schnell damit durch, aber es lässt einen einfach nicht mehr los. Wie erwartet hat Oliver Pötzsch auch hier wieder die Hintergründe perfekt recherchiert und im Nachwort findet man auch die ganzen kleinen Details, die er sich für diese Geschichte mühevoll zusammen gesammelt hat. Sowas liebe ich in historischen Geschichten, wenn man dabei auch authentische Fragmente aus der Vergangenheit erfährt, die dabei noch so gekonnt in eine interessante und sehr unterhaltsame Geschichte verpackt werden. Ich hoffe sehr, dass diese Reihe noch lange weitergeht, denn ich bin jedes Mal wieder aufs Neue total begeistert von der Ideenvielfalt und der Authentizität, die uns Oliver Pötzsch mit so viel Charme und Kompetenz in seinen Büchern näher bringt. Potzsch always writes a great book, but his insistence on drawing parallels between Oberammergauers hating outsiders and the Islam problem in Europe today is unforgivable. In his notes, he mentions the "right wing hate groups" he modeled that part of the story after. Sorry Potzsch, but one doesn't have to be right wing, or hate people to realize that Europe is chock full of more rapes, violence, and terrorist attacks thanks to unfettered islamic immigration. Islam is to be feared. And its not rac Potzsch always writes a great book, but his insistence on drawing parallels between Oberammergauers hating outsiders and the Islam problem in Europe today is unforgivable. In his notes, he mentions the "right wing hate groups" he modeled that part of the story after. Sorry Potzsch, but one doesn't have to be right wing, or hate people to realize that Europe is chock full of more rapes, violence, and terrorist attacks thanks to unfettered islamic immigration. Islam is to be feared. And its not racism. Its not xenophobia. It's using the brain God gave us all. This is the 6th book in the Hangman series. This one felt even more drawn out and could have been at least 100 pgs shorter. It’s not my favorite, but I enjoyed it well enough. I think it’s probably time for this series to wrap up. I loved "The Play of Death", Oliver Potzsch's latest in book in The Hangman's Daughter series. With the usual cast of characters (Magdalena, the hangman's daughter; Jakob Kuisl, the hangman of Schongau; Simon, Magdalena's wife; and assorted neighbors, politicians and so on), the story moves from Schongau to nearby Oberammergau, home of the famous Passion Play. Simon is taking his son Peter to Oberammergau to attend school there, where he can hopefully be free of the taint of being the hangman's grandson, and can get the education that will give him more opportunities in life. But the two arrive in town to find that a grisly murder has just occurred; the man who is to play Jesus in the Passion Play have been crucified and left to die. Simon leaves Peter with his good friend Georg Kaisel who is the local schoolmaster, and is asked by a senior member of the council to remain a few extra weeks as medicus to serve the local population. But all is not as it should be in not so peaceful Oberammergau. The established population has it out for the immigrant population, and to add to the tension, additional actors in the Passion Play are murdered, one by one. And what are those lights around the top of the spooky mountain? Who are the small figures seen flitting around at night in the dark? Meanwhile, back in Schongau things aren't going any better. Corrupt council members plan a coup to take over the town council and control all the trade that goes through the town. The Kuisel family is having issues of it's own: younger daughter Barbara can't seem to stay out of trouble, Magdalena is having problems with her son Paul, and then of course there are all the challenges that come along with being a "dishonorable" family, as those like the hangman are called. Just to keep us even more engaged, The Play of Death has several different crises happening in different places...or are there links between them? The Play of Death is 500+ pages which I read in 2 1/2 days, finally throwing in all pretence and reading it to conclusion at 1am because I couldn't wait to know how the mysteries resolved. I have read all six of these novels and I’ve grown to care for the Kuisl family, from Jacob the hangman to Magdalena and Simon, his daughter and son-in-law to the twins, Peter and Paul, Jacob’s grandsons. Their adventures are very in-depth with all myriad twists and turns. Plus you get a rich history of Bavaria and all their customs and superstitions along the way. Thoroughly enjoyable. Thank you Oliver Potzsch! Crime in the mid 1600's Germany doesn't pay. It usually ends up with a date with the hangman. Yet, there's never a shortage of fodder for the hangman's craft. This installment kept all members of the family in danger. I anxiously turned the pages (figuratively since this was an ebook) hoping that justice would prevail. Another splendid book in the Hangman's Daughter series. The writing is consistently good throughout the books. I enjoy seeing how the characters develop over the span of years, from the first book through the sixth. I'm looking forward to the 7th book that will be out in May. Awesome, as usual! i love this series so much! Another excellent volume in this series. This story highlights the current battle over refugees and immigrants and tries to impart the lessons of history to help us see we are all the same. Oh - and there is of course a great mystery or two. Modern views of the German village of Oberammergau and its famous Passion Play may be shaken by the darker portrait of the place and the drama in this sixth entry in the Hangman's Daughter series. Simon Fronwieser, Magdalena's husband, escorts their precocious seven-year-old son to Oberammergau where he is to receive schooling under Simon's old mentor and friend. They arrive in the village just in time for the barbarous murder of the star of the Passion Play, which has been moved up from its norm Modern views of the German village of Oberammergau and its famous Passion Play may be shaken by the darker portrait of the place and the drama in this sixth entry in the Hangman's Daughter series. Simon Fronwieser, Magdalena's husband, escorts their precocious seven-year-old son to Oberammergau where he is to receive schooling under Simon's old mentor and friend. They arrive in the village just in time for the barbarous murder of the star of the Passion Play, which has been moved up from its normal schedule to suit the financial ambitions of a merchant. Simon is joined by Jakob Kuisl, his father-in-law, the Schongau hangman, and they begin investigating this murder and other mysterious goings on in the village. Meanwhile back home, Jakob's younger daughter Barbara is accused of witchcraft by a local doctor and town official who are plotting to take over Schongau's government in the absence of the local elector. A pregnant Magdalena sets off on a perilous journey to save her sister and warn of the underhanded goings on in Schongau. Potzsch weaves a complex plot involving greed, superstition, hidden treasure and smuggling which puts all members of the family in danger before the mysteries are finally unraveled. Every time a new Hangman's Daughter book comes out, I am never disappointed. I always wonder what else in Bavaria could Jakob Kiesl get himself into! This particular story takes Simon and Jakob on a mystery adventure while Simon is taking his son to another village to be educated by an old schoolmaster and friend. The story takes all kinds of twists and turns, and shows us why Bavaria is a place of legend. This series has been an absolute favorite of mine since I discovered it. It is a great blen Every time a new Hangman's Daughter book comes out, I am never disappointed. I always wonder what else in Bavaria could Jakob Kiesl get himself into! This particular story takes Simon and Jakob on a mystery adventure while Simon is taking his son to another village to be educated by an old schoolmaster and friend. The story takes all kinds of twists and turns, and shows us why Bavaria is a place of legend. I was disappointed in this book, politics had no place in it, I wonder how you feel now with all the Terrorist attacks going on. Right wing extremism? I am done with your books, not what I want to read. Disclaimer: I received a Kindle download of this book through a Goodreads giveaway to facilitate this review. No other compensation was offered or requested. The year is 1670, and the people of Oberammergau are preparing their every-ten-years Passion Play…though some of them think it might be sacrilegious to be doing so four years early. When the actor playing Jesus Christ is found actually crucified on the prop cross, the villagers suspect the Devil is afoot. The deaths of other actors in the ma Disclaimer: I received a Kindle download of this book through a Goodreads giveaway to facilitate this review. No other compensation was offered or requested. The year is 1670, and the people of Oberammergau are preparing their every-ten-years Passion Play…though some of them think it might be sacrilegious to be doing so four years early. When the actor playing Jesus Christ is found actually crucified on the prop cross, the villagers suspect the Devil is afoot. The deaths of other actors in the manner of the Biblical figures they’re portraying certainly lends credence to that hypothesis. Or perhaps it’s God’s wrath, and there’s always the slim possibility of less supernatural murderers. As it happens, medically trained bathhouse operator Simon Fronwieser is in town to enroll his son Peter in grammar school. The town medicus having recently died, Simon is drafted to examine the crucified body for clues and treat the town’s sick people. He’s soon joined by his father-in-law Jakob Kuisl, the hangman of Schongau, who has come with the district secretary to investigate the strange goings-on. But are these murders tied in to the wooden Pharisees? The little men from Venice? Ancient pagan sacrifice? The wrathful quaking of the very mountain under which Oberammergau sits? As the mysteries mount, can the medicus and hangman survive? This is the sixth in The Hangman’s Daughter mystery series to be translated into English; I have not read any of the previous volumes. Naturally, the hangman’s daughters also come into the story. Magdalena is pregnant with what she hopes will be her and Simon’s third child, and waits anxiously for her husband back in Schongau. But Barbara has just reached the age where she is flirting with young men, and she attracts the attentions of a lustful doctor. When Barbara rejects her unwelcome suitor and Jakob backs her up, the doctor vows vengeance and soon he’s using his political connections to have Barbara accused of witchcraft. (It doesn’t help that the young woman has books containing spells under her bed.) There’s a conspiracy on the Schongau town council, and Magdalena must make the perilous voyage to Oberammergau to alert her menfolk to the danger. There’s a lot going on in this book, and much of the solution is figuring out which of the mysterious happenings are directly connected to each other, which are outliers, and which are just coincidence. There’s some topical material: Jakob is struggling with his binge drinking, and the Oberammergau villagers both exploit and hate the immigrant laborers who have come to their valley. Good: The plot is nicely convoluted, providing plenty of cliffhanger moments, while wrapping up nicely with no important threads dangling. Not so good: Some of the villains are cardboard cutouts, with no redeeming qualities to explain how they got into the positions they occupy. I've been falling out of love with Oliver Potzsch's "Hangman's Daughter" series a bit as our heroes grow more established. The mysteries haven't been quite as intriguing, and Potzsch has far too many annoying writer's tics for me to ignore - his characters do far too much 'winking' when making a point, verbs are underlined with superfluous adverbs (I've lost count of how many 'sly grins' are used), and our fearless heroes are far too good at sneaking up on dastardly villains just in time to hear I've been falling out of love with Oliver Potzsch's "Hangman's Daughter" series a bit as our heroes grow more established. The mysteries haven't been quite as intriguing, and Potzsch has far too many annoying writer's tics for me to ignore - his characters do far too much 'winking' when making a point, verbs are underlined with superfluous adverbs (I've lost count of how many 'sly grins' are used), and our fearless heroes are far too good at sneaking up on dastardly villains just in time to hear an incriminating statement. All that being said, Potzsch has created a great setting with 17th century Bavaria and shows a terrific command of the time and place. Investing his stories with pre-modern sensibilities and medical notions (these are the days of potions, spells, and demons), not to mention a barbaric system of both justice and class, Potzsch always makes his journey interesting, if not riveting. The sixth novel in the series, "The Play of Death," is one of the finest in the entire series. Our intrepid family, the Kuisls, find themselves up to their necks with a dizzying set of interlocking mysteries. The hangman, Jakob, is still bereft after the death of his wife, and he seeks solace in finding the bottoms of beer steins. But Jakob is still respected (by some) for his deductive skills, and soon he and his son-in-law, the medicus Simon, travel to nearby Oberammergau to investigate a mysterious death involving the village Passion Play. In Oberammergau, they find that nothing is simple, except for the rabid hatred the Oberammergauians have for any and all outsiders. Back in Schongau, Jakob's daughters Magdalena and Barbara, are alone and at the mercy of a different group of villains. How can the Kuisls get out of this mess? With a healthy dose of coincidence and perfect timing, of course, but also with large amounts of wit, grit, and bravery. The first thing I always like about The Hangman's Daughter series is the verisimilitude. I couldn't tell you a thing about 1600's era Germany, but Oliver Potzsch sure makes me think HE could. In book 6 of the series, the entire Kuisl/Fronheiser family gets in on the act. Simon Fronheiser, the Schongau medicus and bathhouse keeper, has decided to bring his son Peter, the most scholarly of his children, to Oberammergau, site of the famed Passion Play, so that Peter might gain an education from Georg Strang, Simon's former schoolmaster. The trouble is: the actor cast in the role of Christ in the Passion Play is found crucified in the town cemetery. Being a medicus, the local chair of the town council engages Simon to serve as coroner and temporary bathhouse keeper while the crime is investigated. Meanwhile, back in Schongau, the Hangman's OTHER daughter, 17 year old Barbara, has gotten herself into trouble by refusing the sexual advances of the town doctor, a respected citizen who considers himself a dandy, and cannot believe a girl so far beneath him could refuse him. Barbara's father, the eponymous hangman, Jacob Kuisl, complicates matters by conking the good doctor a sound shot on the head with a beer stein. Jacob is in real trouble now, but a local official offers temporary refuge by commanding that Kuisl accompany him to Oberammergau, ostensibly to help investigate the crucifixion. Sound complicated? This is NOTHING compared to the numerous mysteries, assaults, crimes and sins that the entire family encounters once Jacob departs. I originally found this series through subscription to Kindle Unlimited, and through it read the earlier books completely free. However, I lost access to them after cancelling the subscription. Recently I found this installment as part of a kindle deal. So I bought it, read it, and enjoyed it. In contrast to some stories, I like the historical context to these (typically explained by the author at the end of the book) as it does not overpower the narrative itself. Indeed I read this particular i I originally found this series through subscription to Kindle Unlimited, and through it read the earlier books completely free. However, I lost access to them after cancelling the subscription. Recently I found this installment as part of a kindle deal. So I bought it, read it, and enjoyed it. In contrast to some stories, I like the historical context to these (typically explained by the author at the end of the book) as it does not overpower the narrative itself. Indeed I read this particular installment at the perfect time as I subsequently read newspaper reports of preparations for the real passion play on which the book is based. The books have also always felt more real for knowing the author’s ancestral history. In tone, they are reminiscent of Agatha Christie, with twists and turns that I always think I’ve worked out but never quite do. The writing needless to say is not quite Agatha Christie, but then, so rarely is it that I can’t hold that against the author. But this really does not stop the stories being thoroughly enjoyable. About the right length to keep interest going. Slightly more-ish from the end of one chapter to the start of the next. As I haven’t reviewed any of the earlier books in the series, I will say here that I find it slightly odd that the series is named for the Hangman’s Daughter when typically she seems to be the lesser of the three main characters. I suspect the ‘Hangman’s Son-in-Law’ didn’t have quite the same ring to it. This particular storyline was ever so slightly far fetched but, well, it’s a good thing to push the boundaries of reality a little bit every now and then. Our friends Jakob, Simon, & Magdalena are hot on the heels of another murder mystery. In the neighboring town of Oberammergau, the actor that was slated to play the part of Jesus in the town's Passion Play has literally been crucified on the cross. Was the understudy so jealous of the part that he needed to get rid of the actor? Simon was already in town to bring his oldest son to school for the year. Naturally he decides he needs to stay in town & do his part to help solve the mystery. Our friends Jakob, Simon, & Magdalena are hot on the heels of another murder mystery. In the neighboring town of Oberammergau, the actor that was slated to play the part of Jesus in the town's Passion Play has literally been crucified on the cross. Was the understudy so jealous of the part that he needed to get rid of the actor? Simon was already in town to bring his oldest son to school for the year. Naturally he decides he needs to stay in town & do his part to help solve the mystery. Meanwhile in Schongau, Jakob's youngest daughter Barbara finds herself the recipient of a wrongful witch accusation, locked in a dungeon awaiting trail & certain death. Her only hope is if her oldest sister Magdalena is able to locate her father the hangman & the town "mayor" & bring them home to restore order in the town. Of the 6 books currently in the Hangman's Daughter series, I would rank this one #3. It had 2 different story lines happening simultaneously, but of course they weren't stand-alone incidents --- they were linked together. I enjoyed the more prominent role that Barbara played in this book. I can't say that she was my favorite character since she struck me as a bit too naive & reckless, but this added depth to the existing cast of main characters. We also got to spend a bit more time w/the town midwife Marta. Simon & Magdelena's 2 sons also were along for the ride once again. I'm happy to know that good ol' Jakob will soon be the grandpa to another little grandbaby! Disclaimer: I received a Kindle download of this book through a Goodreads giveaway. This is the sixth book in the series and I have read them all in order so was already familiar with the characters. The Kiusl family is once again up to their eyeballs in some kind of trouble or another. Jacob is suffering from depression after the death of his beloved wife and has taken to drowning his sorrows in alcohol. Jacob's youngest daughter, Barbara is starting to run wild and along with Jacob's drinking, Disclaimer: I received a Kindle download of this book through a Goodreads giveaway. This is the sixth book in the series and I have read them all in order so was already familiar with the characters. The Kiusl family is once again up to their eyeballs in some kind of trouble or another. Jacob is suffering from depression after the death of his beloved wife and has taken to drowning his sorrows in alcohol. Jacob's youngest daughter, Barbara is starting to run wild and along with Jacob's drinking, bring shame on their already "dishonorable" family. When Barbara is attacked by the lustful town doctor, Jacob retaliates in a drunken rage and is in danger of being expelled from the town. Meanwhile Simon has taken his eldest son Peter to the nearby town of Oberammergau to attend school where he hopes that Peter can expand his educational opportunities without being held back by everyone knowing that he is part of a "dishonorable" family. Unfortunately, Simon and Peter arrive in Oberammergau on the same day that a grisly murder is discovered. The town puts on a Passion Play and the actor who was to play Jesus has been crucified on the cross on the set of the play. [Disclaimer: I received a Kindle download of this book through a Goodreads giveaway to facilitate this review. No other compensation was offered or requested.] This is the 6th book in the Hangman's Daughter series and I have read and enjoyed them all. I would classify this book (and series) as a historical mystery thriller. The story opens with the horror of the first victim as he slowing dies on a cross in the Oberammergau cemetery. The man was cast to play Jesus in the famous Oberammergau Pass [Disclaimer: I received a Kindle download of this book through a Goodreads giveaway to facilitate this review. No other compensation was offered or requested.] This is the 6th book in the Hangman's Daughter series and I have read and enjoyed them all. I would classify this book (and series) as a historical mystery thriller. The story opens with the horror of the first victim as he slowing dies on a cross in the Oberammergau cemetery. The man was cast to play Jesus in the famous Oberammergau Passion Play. It is to this town that Simon Fronwieser (the Hangman's daughter husband) is bringing his oldest son to study under Simon's old friend and teacher Georg Kaiser. Soon after his arrival, Simon's father-in-law the Schongau hangman, Jacob Kuisl shows up, and the two begin to try to solve the murder. Before long other deaths occur and the mystery deepens. Meanwhile back in Schongau, Jacob Kuisl's youngest daughter Barbara gets accused of witchcraft while trying to uncover some shady dealings by the town's physician. She is facing torture and death, and it is up to her older sister Magdelena to go to Oberammergau to get help. The story builds towards an exciting ending, with a number of twists along the way. I was excited when I found out that I had won a HANGMAN'S DAUGHTER book from Goodreads. I couldn't wait to dive into the medieval world of hangman Jakob Kuisl and his family. THE PLAY OF DEATH certainly didn't disappoint. It was of the same caliber as the rest of the series. I don't want to give anything away, but I will say that I had become very concerned with the character Jakob. He seemed to be spiraling out of control showing the same behavior as his late father. However, by the book's end, I was excited when I found out that I had won a HANGMAN'S DAUGHTER book from Goodreads. I couldn't wait to dive into the medieval world of hangman Jakob Kuisl and his family. THE PLAY OF DEATH certainly didn't disappoint. It was of the same caliber as the rest of the series. I don't want to give anything away, but I will say that I had become very concerned with the character Jakob. He seemed to be spiraling out of control showing the same behavior as his late father. However, by the book's end, I felt Jakob had righted himself. The plot of the story is appropriate for that time period, as well as, some of the things happening today. Within the telling of the various murders in the town is the hatred of the townspeople toward immigrants, people who came to the town when the town was in need of them but now were hated and being blamed for any misfortunes. Potzsch does it again. A return to form after the somewhat disappointing Werewolf entry in the Hangman's Daughter series. A few years have passed and Jakob is finding solace in drink while his daughter Barbara dreams of being able to escape her label as a hangman's daughter. Jakob and his son-in-law wind up up the valley in Oberammergau investigating the death by crucifixion of the lead actor in the passion play that the town is performing ahead of schedule, in order to make money for the town c Potzsch does it again. A return to form after the somewhat disappointing Werewolf entry in the Hangman's Daughter series. A few years have passed and Jakob is finding solace in drink while his daughter Barbara dreams of being able to escape her label as a hangman's daughter. Jakob and his son-in-law wind up up the valley in Oberammergau investigating the death by crucifixion of the lead actor in the passion play that the town is performing ahead of schedule, in order to make money for the town coffers. Potzsch does a terrific job with the mystery but the historical pieces are woven in deftly and make for a believable set of circumstance. The towns along the Ammer River no longer see the trade traffic they used to. And a primarily feudal agrarian society is giving way to a middle class of artisans, physicians, and self-made traders. To say more would give the plot away. Readers of The Hangman's Daughter series will certainly want to read "The Play of Death", the sixth book in the series. The main players are still there, and there is more mystery, intrigue, and murder afoot. Simon leaves town to take his son to a school in a distant village accompanied by his father-in-law, the Hangman. For the Hangman the trip is part of his job, not for pleasure. The death he will investigate is not simple, and more are to follow. 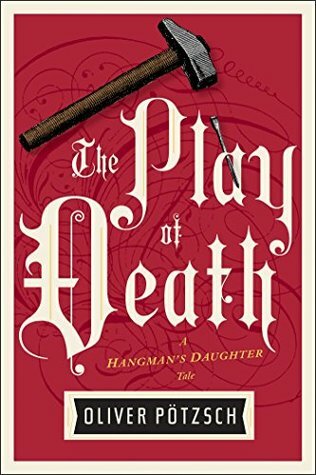 For those who have not read any Oliver Potzsch Readers of The Hangman's Daughter series will certainly want to read "The Play of Death", the sixth book in the series. The main players are still there, and there is more mystery, intrigue, and murder afoot. Simon leaves town to take his son to a school in a distant village accompanied by his father-in-law, the Hangman. For the Hangman the trip is part of his job, not for pleasure. The death he will investigate is not simple, and more are to follow. For those who have not read any Oliver Potzsch books, I suggest you begin at the beginning with book one. There are several reoccurring characters to keep track of. Or, if you aren't ready for a long series you might try choosing one from another of his series. Do you ever find yourself reading a book because you liked the author's original works? I think Potzsch's first few books in this series were very entertaining and I loved how he came up with the idea for the books. But both number 5 in the series and now this book just do not have the same feel for me. His first books did a wonderful job of setting the mood in time and place and working through the characters. Now, I feel as if he is just plugging away at stories to sell books. The depth of the Do you ever find yourself reading a book because you liked the author's original works? I think Potzsch's first few books in this series were very entertaining and I loved how he came up with the idea for the books. Oliver Pötzsch is a German writer and filmmaker. After high school he attended the German School of Journalism in Munich from 1992 to 1997. He then worked for Radio Bavaria. In addition to his professional activities in radio and television, Pötzsch researched his family history. He is a descendant of the Kuisle, from the 16th to the 19th Century a famous dynasty of executioners in Schongau.